Affirming refugees’ economic rights and dignity is more than charity; it’s an act of national redemption. The ravenous hatred of the Trumpian right-wing media has found a soft target in a yogurt company in small-town America. Xenophobic pundits have in recent months warned of a brewing terrorist cell at Chobani, a Greek yogurt brand that runs an internationally renowned social-enterprise program supporting hundreds of refugees from distressed countries. But, fortunately, the panic might have been been misplaced: A larger rescue operation is underway nationwide in grassroots programs struggling to resettle refugees in American towns and cities—a modest, quiet effort facing an increasingly uncertain future under a far-right president. A more homegrown refugee enterprise is launching in Minnesota, through a collaborative development effort led by and for refugees in the Twin Cities Somali immigrant community. The Cedar-Riverside Opportunity Center lacks Chobani’s sleek branding, but it provides a more robust model for long-term resettlement for a marginalized refugee community. Founded by EMERGE Community Development in Minneapolis along with the Cedar-Riverside Youth Council, a Somali community group, the center will aim to bridge the employment gap and foster educational opportunity for refugee youth with services like job training, youth mentorship, GED prep, and community-college programs. The center (which avoided federal assistance and opted instead for local funds and private donations) will also partner with labor unions to connect youth facing education or employment barriers with career-track apprenticeships. The program will target young Somali-American men aged 14 to 24, who, as members of the Muslim immigrant and black communities, are especially vulnerable to institutionalized discrimination, targeting by local or federal law enforcement, joblessness, and social instability. The social and economic struggles facing refugee populations in the US intersect with gaps in the assistance provided by federal refugee-resettlement system—a disjointed system of private groups and agencies that provides just enough aid for refugees to survive, but not live, in their new homeland. In a recent report on Syrian refugee resettlement, Samir Alrshdan, a middle-aged Syrian former factory owner who immigrated to Hamtramck, Michigan—America’s only majority Muslim city—reflected: “Even if I have to sell everything I own, I want to pay back this money. I want to be the perfect citizen here and show gratitude.” But he still struggles to access English-language education and financial aid, while facing a $12,000 debt for the cost of traveling to the US. 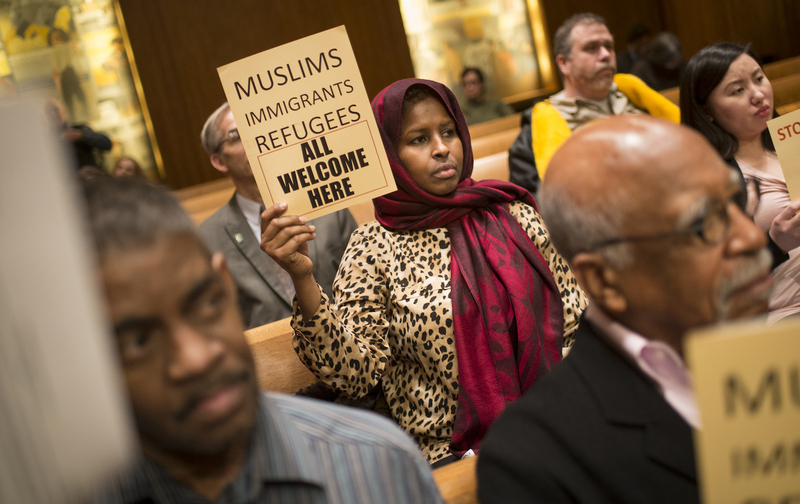 Advocates have demanded more comprehensive choices and flexibility for resettling refugees. Their challenges will likely deepen under a Trump administration, as his hardline stance on Muslim immigrants could lead to budget cutbacks or blockage of future refugee admissions. While refugees in other countries often struggle under even worse conditions, international NGO networks have pioneered programs to help refugees develop small businesses or to provide steady basic income through electronic financing. US resettlement programs are fraught with institutional barriers. Direct aid for families is short-term and extremely low, leaving refugee households struggling with basic needs as they transition from crisis. Currently, federal resettlement funding is roughly between $1,000 and $2,000, but, according to Harvard researchers, “the actual cost of initial resettlement is $3,492. In fact, federal funding currently accounts for only 39 percent of the total cost of refugee resettlement, with the remainder coming from private fund-raising.” The pressures on local social services may grow, depending on whether the next administration expands or curtails the pending admissions of new Syrian refugees. In addition, refugees are often placed in isolated areas, away from ethnic social networks, constraining them from moving to unite with families or to pursue education and job opportunities. The almost singular emphasis on self-sufficiency and economic independence, while a laudable objective, risks limiting opportunities for refugees,” and “overlooks a more robust understanding of integration which includes psycho-social, linguistic, and cultural integration. To deal with incoming refugees, the United States has considered establishing a system of private sponsorship of refugees by communities. While this privatized model has been widely used and praised in Canada, it also suggests a trend toward further outsourcing and divestment of humanitarian support services to individuals and charities rather than state support. While a paycheck is a first step for stabilizing refugees, meaningful economic integration hinges on a long-term cultural transition for both refugees and their host communities—which requires a collective effort driven by government resources and community-based service groups. Upohar, a small culinary business in Lancaster, Pennsylvania, is developing an ethnic culinary business for refugee women seeking jobs and social support. After an initial unsuccessful attempt to launch a brick-and-mortar restaurant, which recently had to fold, founder Srirupa Dasgupta is now relaunching the business as a scaled-down catering enterprise. Instead of a full-fledged restaurant, the company will engage refugees through a culinary-training program, which will create an employment pipeline for other local food-service businesses. A focus on training and workforce development, in Dasgupta’s view, will prove a stabler business model than a self-standing start-up, because “Steady hours are necessary to provide steady income for the employees, and it also helps the business generate revenue.” The menu hasn’t changed, however: The main purpose is to empower women by earning a living serving their families’ home-cooked African, South Asian, and Middle Eastern dishes. Upohar is tiny compared to Chobani’s yogurt enterprise, but culturally it reaches beyond traditional aid, helping refugees reconnect with traditional food ways and share their cultures with others. The right-wing yogurt haters were right about only one thing: Labor can be vitally empowering for refugee communities. But that should be the rallying cry of grassroots groups in every town where the displaced are putting down roots in America. Affirming refugees’ economic rights and dignity is more than charity; it’s an act of national redemption.